If you chose to install WordPress in a different folder from the root directory of your account, make sure you indicate this fact in the URL for the install script. If you transferred the WordPress software files to a folder called /blog, for example, you would point your browser to the following URL to run the installation: http://yourdomain.com/blog/wp-admin/install.php. 2Click the Create a Configuration File button. 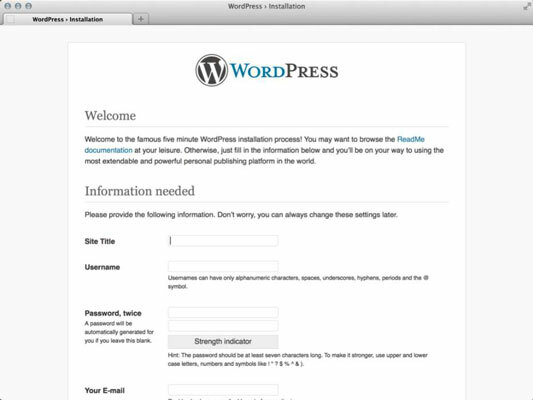 The next page that opens is a Welcome to WordPress message, which gives you the information you need to proceed with the installation. Database Name: Type the database name you used when you created the MySQL database before this installation. Because hosts differ in configurations, enter either the database name or the database name with your hosting account username appended. If you named your database wordpress, for example, you would enter that in this text box. Or if your host requires you to append the database name with your hosting account username, you would enter username_wordpress, substituting your hosting username for username. User Name: Type the username you used when you created the MySQL database before this installation. Depending on what your host requires, you may need to append this username to your hosting account username. Password: Type the password you used when you set up the MySQL database. You don’t need to append the password to your hosting account username here. Database Host: Ninety-nine percent of the time, you’ll leave this field set to localhost. Some hosts, depending on their configurations, have different hosts set for the MySQL database server. If localhost doesn’t work, you need to contact your hosting provider to find out the MySQL database host. Table Prefix: Leave this field set to wp_, although you can change the table prefix to something completely random to increase security for your site, such as xyz123_. 4When you have all that information filled in, click the Submit button. 5Click the Run the Install button. You see another welcome page with a message welcoming you to the famous five-minute WordPress installation process. Site Title: Enter the title you want to give your blog. The title you enter isn’t written in stone; you can change it later. Username: This is the name you will use to log in to WordPress. By default, the username is admin, and you can leave it that way. However, for security reasons, it’s recommended practice to change your username to something unique to you. Password: Type your desired password in the first text box. Then type it again in the second text box to confirm that you’ve typed it correctly. If the two versions of your password don’t match, WordPress alerts you with an error message. If you don’t enter a password, one will automatically be generated for you. Your E-mail: Enter the e-mail address you want to use to be notified of administrative information about your blog. You can change this address later, too. Allow my Blog to Appear in Search Engines Like Google and Technorati: By default, this check box is selected, which lets the search engines index the content of your blog and include your blog in search results. To keep your blog private and out of the search engines, deselect this check box. 7Click the Install WordPress button. The WordPress installation machine works its magic and creates all the tables within the database that contain the default data for your blog. 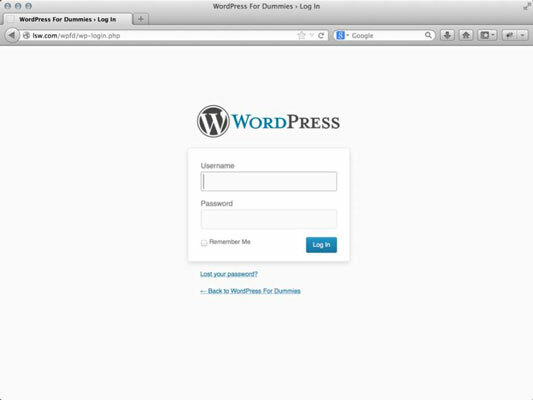 WordPress displays the login information you need to access the WordPress Dashboard. Make note of this username and password before you leave this page. Scribble it down on a piece of paper or copy it into a text editor such as Notepad. 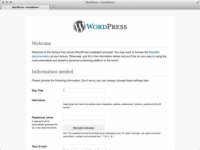 After you click the Install WordPress button, you receive an e-mail with the login information and login URL. This information is handy if you’re called away during this part of the installation process. So go ahead and take a 15-minute break. If you somehow get distracted away from this page, the e-mail sent to you contains the information you need to successfully log in to your WordPress blog. 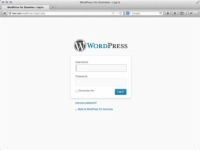 8Click the Log In button to log in to WordPress. If you happen to lose this page before clicking the Log In button, you can always find your way to the login page by entering your domain followed by the call to the login file (for example, http://yourdomain.com/wp-login.php). You know that you’re finished with the installation process when you see the login page. Congratulations on your newly installed WordPress blog!